From personal growth, milestones accomplished, and my growing curiosity for whats happening around the world – 2017 taught me more than I could ever imagine. I learned that you will be right…but you will also be wrong. Many times. Accept it because it is in those times where we are wrong that we throw ourselves into a learning experience…and what more could we ask for? I’ve learned that comfortable isn’t always good. Comfortable is usually a safety net. What is good? Taking that step. Whatever it may be. Big or small. That step usually leads us into the world of growth. Not only will that step teach us but it will teach those around us to do the same. I learned to surround myself with GOOD people. Not just any people for the sake of doing so. People who are inspired by small acts, motivated by hard work, enjoy the entire journey, and who dream BIG. The people in 2017 taught me to take risks, share knowledge but to also listen, and that it is OKAY to dream too big. These people showed me how hard work can take us anywhere we want and that people really do make this world go around. I’ve learned to lean on others every once in awhile. When we lean on others, it is not a sign of weakness, rather a time when we are just asking for a different perspective on life. I think this lesson will be written on a separate blog because it may have been the greatest lesson of them all. So stay tuned….. I learned that it is OKAY to watch priorities shift. It doesn’t mean anything needs to take back burner, it just means we are growing, learning, and finding other parts of life we are passionate about. It doesn’t mean you have to drop something that was once on the top of your priority list it just means you are looking at that same list with a different point of view and a few other additions. I learned that we live in a world where diversity is not appreciated as much as it should be. Think about this? What if a book was made up of a bunch of blank white pages? Pretty boring, huh? Just because someones beliefs are different, they look different than you, or they live in another part of the world doesn’t mean we should not appreciated or look down on them. One of the greatest gifts we are given is the ability to have an open mind and man, do people not use that gift as they should be using it. I learned that the greatest lesson is taking the time to listen to others, research, and experience things outside OUR life. Try it, I dare you. I learned as humans we do not take enough time to BE. Instead, we are too worried about DOING. Think about it. We have “to do lists “ compiled of places we want to go, chores we need to get done, things we need.. etc. Now think about how many times did you take time to BE in the moment during those times. 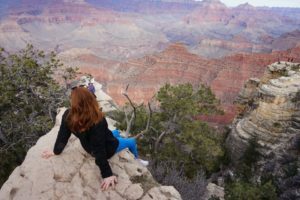 Did you go on vacation for the perfect instgram picture or did you go on vacation to enjoy the time away from your normal routine, to talk to locals, enjoy the culture, to make memories with friends and family, and most importantly – to live. I learned what it means to be a human BEING. So whats next, 2018? Unapologetically Live. Say how you feel. Travel where there is adventure. Live with intention. Surround yourself with people who are passionate. Continue to dream too big. And do what makes YOU happy. I know it’s been awhile since I wrote last. I’m sorry. I’m hoping in 2018 I’ll have an easier time putting my thoughts and ideas to paper. Effusive and enthusiastic, Callahan wasn’t someone who liked sitting still. She was also competitive, so it seemed natural to her that she would be a swimmer even if she couldn’t use her legs. “I loved the water,” she says. Then one of her swim coaches, Keri Serota, a triathlete, invited Callahan to a summer triathlon camp in 2011 when she was 15. The camp concluded with a mini-triathlon. 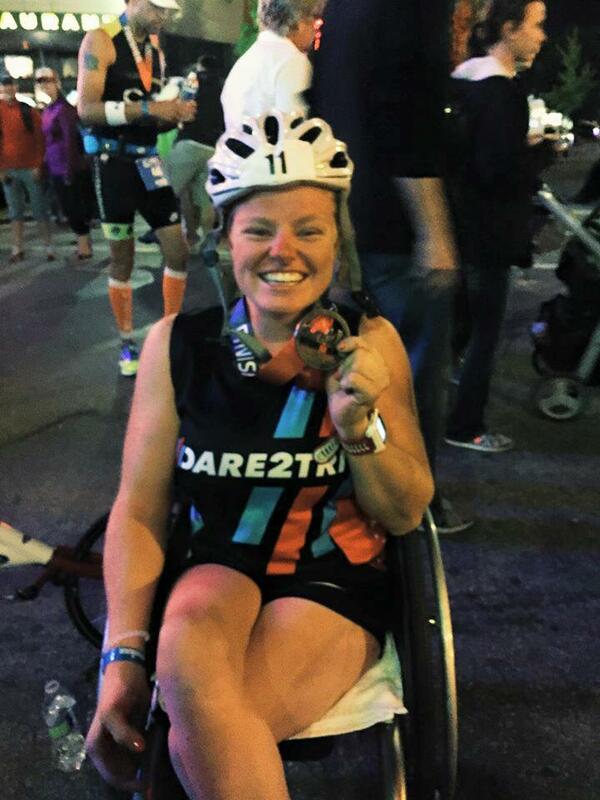 “The moment I crossed the finish line, I was hooked,” she says. Today, the 20-year-old Callahan is one of the world’s best athletes in her field. Last May, she won the London triathlon, part of the ITU (International Triathlon Union) World Triathlon Series, and attained her elite status on the international circuit. 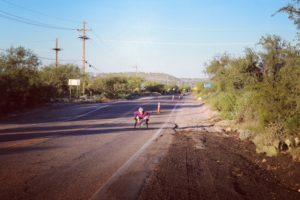 This past January, she won the Arizona Rock ‘n’ Roll marathon in Phoenix. She is ranked No. 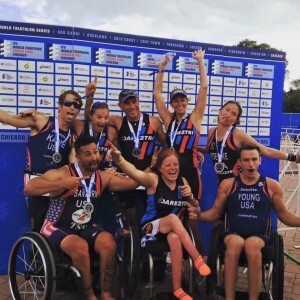 3 worldwide in her paratriathlon division going into this weekend’s ITU World Triathlon in Yokohama, Japan, and now is gunning for the 2020 Paralympics. That sort of success culled from the seeds of disappointment befits Callahan’s personal motto, “Never never never give up.” Her parents, Jack and Joanne Callahan, drilled that belief into her when she was growing up, repeating it often to her and pasting it on signs all over the house. She uses it in her email signature, brandishes it on her website, and embodies it. She hung onto it during the tough days of a lawsuit she filed in high school so she could compete with her teammates. And she repeats it to herself now when she’s enduring a tough training session or simply having a bad day. “If you believe in something so much, and keep pushing for it, you’ll get there,” she says. Callahan has had to push for years. 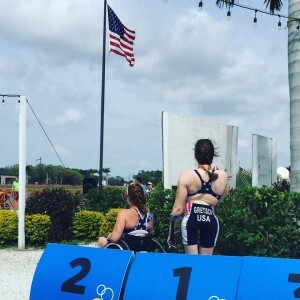 As a high schooler, she excelled at swimming, placing third in her division at the USA Paratriathlon National Championships in Austin, Texas, and getting invited to represent the United States at competitions in New Zealand and the Czech Republic. 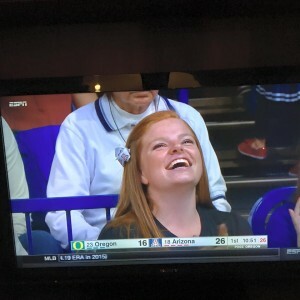 Yet back at home in Oak Park, Illinois, she was not allowed to compete with her high school swim team in the state tournament because the Illinois High School Association (IHSA), like 31 other states, did not have competition standards for athletes with disabilities. It was as if those athletes didn’t exist. That didn’t seem right to Callahan. 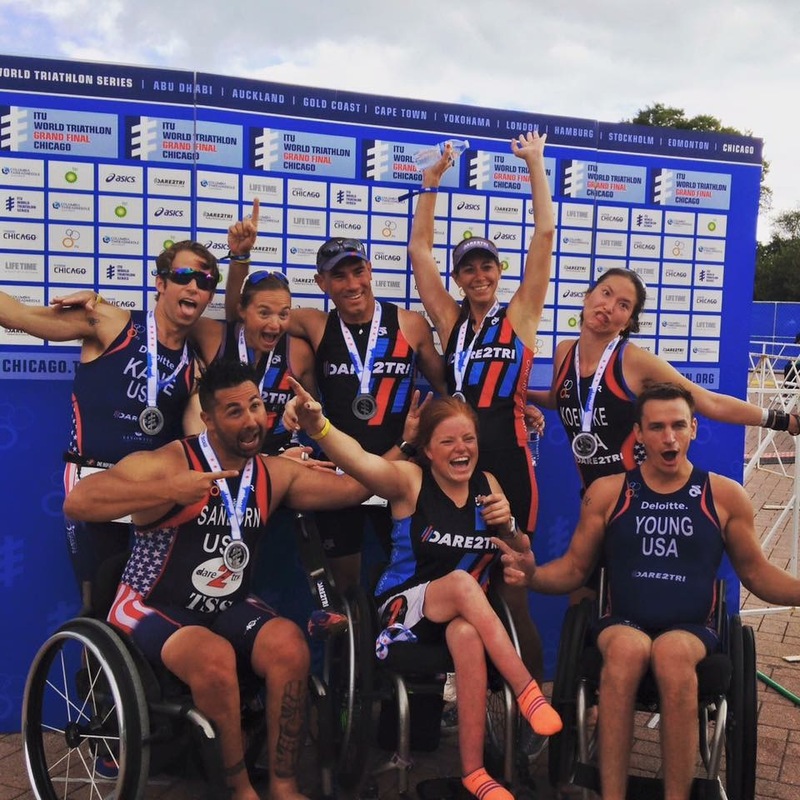 For Callahan, an important part of the settlement, which covered disabled athletes in swimming as well as track and field, was the inclusion of qualifying standards. That validated those who made it to the state tournament as competitors, not simply disabled students granted entry out of sympathy. “We wanted competitive standards because we are athletes,” she says. 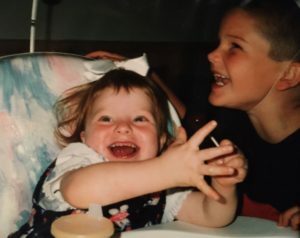 Callahan currently logs 15 to 18 hours a week training, divided between the pool, wheelchair “runs,” the hand-crank bike, and the weight room. On top of that, there’s time spent stretching, wheeling around campus, and lifting her bike and chair in and out of her car. Her workload focuses almost entirely on her arms and shoulders. “When I’m ready to go to bed at the end of the day, they’re ready to go to bed, too,” she says with a laugh. 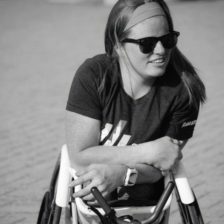 Despite all of the hours devoted to training and all of the laurels she has to show for it, sometimes others still look at Callahan and only see a young woman in a wheelchair and not a world-class athlete. 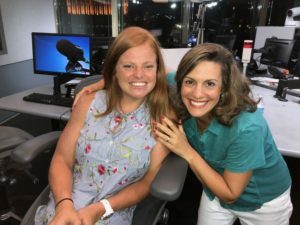 When she tells people who don’t know her well that she’s going to Yokohama the week after finals to compete in the ITU World Triathlon, they’re like, What?“It can be hard for them to wrap their head around the concept of me going to Japan to compete in an international event,” she says. At the same time, Callahan does want her athletic accomplishments to show others what’s possible. She embraces her place as a role model and speaks to groups of younger disabled students. “My hope it that someone will tell a friend in a wheelchair, ‘Hey, I just saw this person in a wheelchair doing triathlons,’ or the parent of a child with a disability will realize what’s possible for their child,” she says. When she isn’t competing on the international stage, Callahan is like any college student. She trains with her TriCat teammates, she’s a member of the Alpha Kai Omega sorority, and she goes out on weekends. After graduation she wants to go to law school. She had watched her father, a judge, at work in the courtroom, but the lawsuit that granted disabled students the right to compete in the Illinois state swim meet solidified her career ambitions. “After seeing what went on behind the scenes, I decided I wanted to do that,” she says. At the moment, though, she’s focused on Yokohama and after that the World Championships in the Netherlands in July, where she hopes to secure a spot on the U.S. national team with a strong showing. Here I am, writing from the best writing spot there is; third row, right side, window seat. I’m on my way back to Arizona after a quick weekend trip home to Chicago. It was one heck of a weekend though… and this is why. 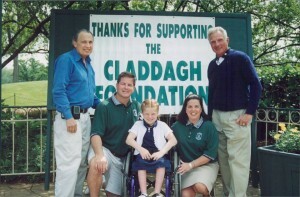 Some of you may know, some of you may not but 20 years ago, following the onset of me contracting Transverse Myelitis, my family started The Claddagh Foundation. The Claddagh Foundation has been around for 20 years now and it is still going strong. The Claddagh Foundation helps assist those conducting research on spinal cord injuries in hopes of one day finding a cure. The Claddagh Foundation also assists organizations that help those living with spinal cord injuries, showing them no dream is ever to big. Over the last 20 years, the Claddagh Foundation has put on a variety of events including: 3 on 3 basketball tournaments, wheelchair basketball tournaments, and 5k races. The one event that has been going on for the last 20 years and the one that is our largest event; the annual golf outing. To date, The Claddagh Foundation has been able to raise over 1.5 million dollars to help people across the country. What is so special is that: so many cousins, aunts, uncles, and friends have grown up to hold the Claddagh Foundation so close to their hearts. Sure we have grown up to looking forward to riding around in the golf cart during the golf outing when we were little, finding out what the next color shirt will be for the 5k, and having one of the greatest days and nights of the year surrounded by friends and family (singing and dancing our hearts out). But what we get excited for most, is knowing that each and every one of us will be able to have an impact on someone’s life because of the support the Claddagh Foundation gets at each event. And that is what it’s all about. What makes our organization stand out? The people. We are stronger than ever because of the people that continue to believe in us and what we do. 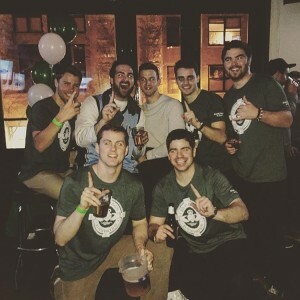 This past weekend, after years of looking up to the original leaders of the Claddagh, the next generation kicked off the 1st Annual: Final FOUR A Cure. They truly did an unbelievable job. 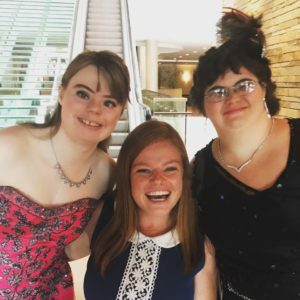 They introduced a new generation of people to everything the Claddagh Foundation has been able to accomplish in the last 20 years as well as what we hope to continue to be able to accomplish in the many years to come. We saw young people all come together for one cause. 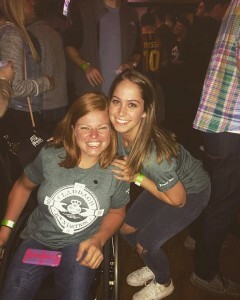 We saw people who may not be effected by someone with a spinal cord injury come together because their friend or coworker knows someone who is. This is the friendship, loyalty, and love each and every one of our supporters possesses and continues to show us, year after year. Having such a successful event like this brings so much hope to a world that has a lot of evil things happening in it. It shows how much power we have if we all come together. We can make a difference. 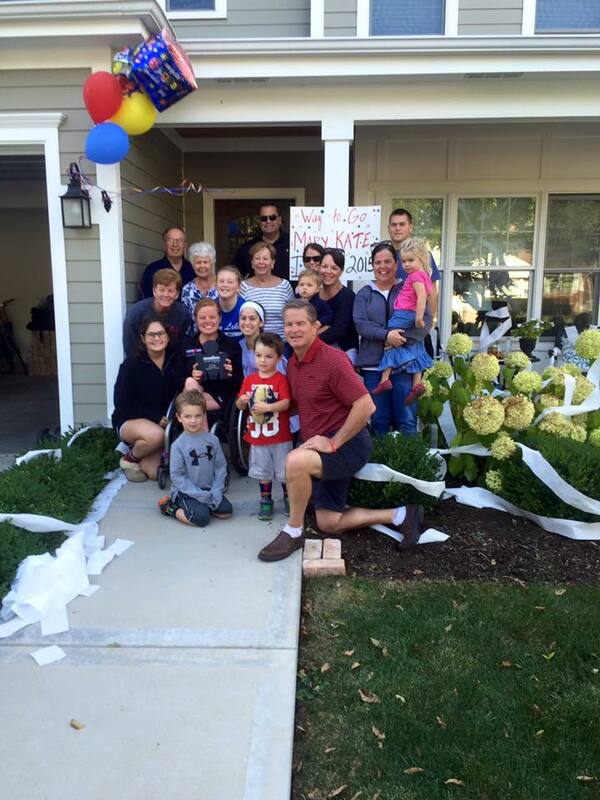 The Claddagh Foundation is part of a fight: fighting for a cure to one day be found. Fighting to give other individuals living with spinal cord injuries the opportunities to go out into the world and do big things, not letting their chair hold them back. We know we have a whole new group of people joining us on this journey. My wish is that one day, I will be standing on my own two feet thanking each and every one of you for never giving up on what the Claddagh believed in but until then, we continue to stand together. I could not have been more proud to be a part of this family last Saturday night. 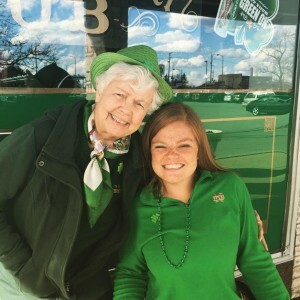 A family that continues to rally around this foundation because they have seen how much of an impact the Claddagh Foundation has been able to have on so many. Cheers to all of you! Cheers to the original leaders of the Claddagh Foundation for teaching our generation that we have the ability to make a difference. Cheers to everyone who helped us organize the event on Saturday. Cheers, to every single person that joined us Saturday night or at any Claddagh event. Cheers to a bright future for the Claddagh Foundation!! Saturday night definitely gave me a little extra inspiration to run a little faster in The Shamrock Shuffle on Sunday. Why? Because I got pretty lucky to be a part of a family that is second to none and continues to let me chase so many of my dreams. This is a personal invite for you to be a part of this one of a kind organization. Be a part of the change and I promise, you’ll have a good time doing it. I think for once, I’m not sitting on a plane as I write this blog….instead I’m sitting at my desk procrastinating finishing unpacking one bag only to pack it right back up again. Time flies when you’re flying, right??? But first, let me rewind. 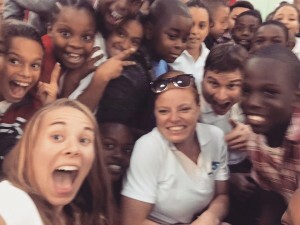 These kids were excited during school visits in Cayman. Push Across Cayman: At the end of February I had to opportunity to head back down to the Cayman Islands with Stay Focused. Stay Focused is the organization I had been down to Cayman the last few years with to scuba dive and this past summer, I was able to go down for their mentor training trip. However, this time- we were heading down to Cayman for one of their big events of the year, Push Across Cayman. Push Across Cayman is a 55 mile run (in our racing chairs) across the BEAUTIFUL Cayman Islands. We headed down to Cayman a week before the event to spend the week talking to the schools around the Cayman area about adaptive athletics. It was pretty neat to see so much enthusiasm came from the kids when we talked about our sports and the event. The actual day of the event couldn’t have gone better, and again Coach Mark prepared me so well for this event. My body felt great the entire time. We spent the month leading up to the Push Across Cayman logging many miles on the racing chair, avg. 50-65 per week. It was so much having both Arielle and Ryan out there pushing as well! I never thought I would say that my legs have been sore in a race, but I proved myself wrong. After sitting on my legs for almost 5 hours, I was a happy camper to jump out of the racing chair at the finish line. When we came across the finish line, along with the cyclist who rode the entire 55 miles with us, we were greeted by so many people from all around Cayman. This was a true testament to why the Cayman area is so special, they continue to welcome us back with open arms year after year. I’ll be honest, when I got back to Arizona following my trip back to Cayman, I had a hard time getting back to the reality of school. I had two weeks that stood between me and spring break…those would soon become the longest two weeks of my life (maybe I’m exaggerating a little??). I knew I didn’t have much time to get my act together though because I would be leaving for Continental Championships in Florida before I knew it. Continental Championships: After surviving those two weeks with school and some more training, I packed my bags ( & bikes, & wheels, & racing chair) and headed down to the sunshine state to meet some teammates before Continental Championships. This race was BIG for a lot of my teammates, this would be the last race they could try to get their provisional spots for the Rio Games. I was super excited to not only race but to be there and watch some of them chase down a dream thats been 4+ years in the making. My classification, PT-1 women, had two new girls from different countries that neither Kendall (USA) nor I had ever raced. It’s always exciting to see our numbers grow, especially for a classification thats not even Rio bound. The numbers are growing and so is the competition…our classification might be one of the smaller ones for now but our finishes are getting more and more exciting as the numbers grow. THE RACE: The venue was Nathan Benderson Park (Sarasota, FL) – let me tell you, this was an amazing triathlon venue. 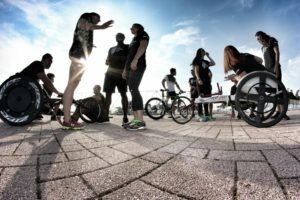 It is known for its rowing facilities but it was also an ideal match to host this triathlon event. My pre-race routine went pretty normal: make sure we were there before equipment check in even opened, set up transition, triple check equipment, swim warm up, and then wait….. the PT-1 classification is the last wave to go off during ITU races so we usually have a solid hour between when warm up closes and the start of our race. Swim: I had a great swim, this swim was one of the first swims I was able to find a group to draft with and woahh does it make a little bit of a difference. A good difference. I was out of the water 2nd, I knew I would be chasing Kendall and that the other girls from Brazil and Columbia would be right behind me. Bike: This course was flat, fast, but windy. I knew I had no time to redline when I had a tailwind. I kept a higher cadence during the headwind to ensure I gave everything in the tank approaching the tailwinds. I knew my bike skills would come to an advantage on a course and on a day like this. I rode hard and came into T2 still holding that 2nd place. 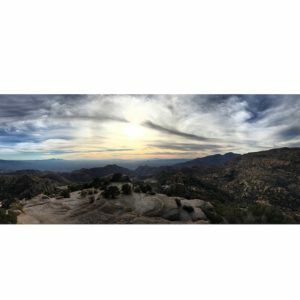 Run: I felt good and fast, I knew it would be a head down and GO run as we ran into the headwind and that is exactly what I did. I ran across that finish line as number 2 and I could not be happier with how the day went. I think I now appreciate short course a little more after racing long course for most of last season. A 9+ hour race compared to 1.5 hours, I knew my body had absolutely no excuse to not be pushing as hard as it possibly could for that short amount of time. I think the hardest part about coming off a long course season last year is finding that run speed right away. In this short of a race, you have no time to mess around with pacing because by the time you realize it- the run is already over. We have been working hard on run speed off the bike and it was definitely nice to see it start to come together again during this race. I love racing this early in the season because after months of off season work, I finally have to opportunity to execute it and see what needs a little more focus leading into the next race. Speaking of next??? After spending a few extra days in Sarasota I headed back to Chicago for the rest of my spring break + St. Patricks Day. Grandma’s favorite day of the year. I had the opportunity to speak to my cousin Molly’s classroom, saw some family and friends, and just enjoyed being home. Next thing I knew, I was on a plane back to Tucson…but not for long. I spent a majority of this weekend getting WAY ahead in school because I’m flying back to Chicago towards the end of this week for the Bank of America Shamrock Shuffle 8k. I love this race, mostly because it combines my three favorite things: Chicago, running, and my love for St. Patricks Day. It’s almost April, which means I have just a little over a month left of school. YIKES! As always, my schedule picks up right around this time because of school ending an my race season being in full swing. After I finish my finals, I fly back to Chicago for a few days before then flying to Japan to race in ITU Yokohama. I’m super excited to be heading back to Japan again, this was one of my first international races back in 2014. I’ll be flying right from Japan to another super exciting opportunity…. more on that in the next few weeks. So for now, I’m trying to wrap up school, get some solid training in, and enjoying the last few weeks in the Arizona with my friends before I head back to Chicago for another fun summer. IT’S TAPER TIME!!!!! This also means Ironman week is here! I feel like it was just yesterday I was standing in line at 3am signing up for this race. All the work is done, so from here on out I promised myself I would just enjoy everything about this week. 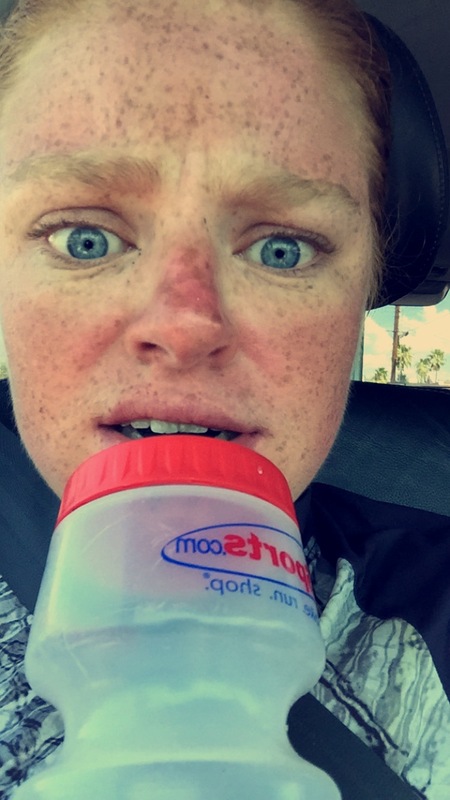 They say you learn a lot of things while training for an Ironman and….. you sure do! I’ve had plenty of stories over the last year but I thought these were some of the note worthy ones. sunglass tan lines are so real. 6. Whitney Houston or Lion King Music works great when you have 0 motivation to get out of the car for a workout. 4. I will always have nightmares about port-potties. I rode my bike an extra 10 miles out of the way to avoid using one. (I need to get over this fear sometime in the next 6 days). 3. 8:30pm bedtime becomes an usual occurrence… even on Saturdays. 2. The world is a pretty cool place via bike. The people you meet along the way will inspire you, train with you, be your biggest cheerleaders, and catch you when you fall…or get a flat. I’ve got a pretty great team that has been behind me from day one. 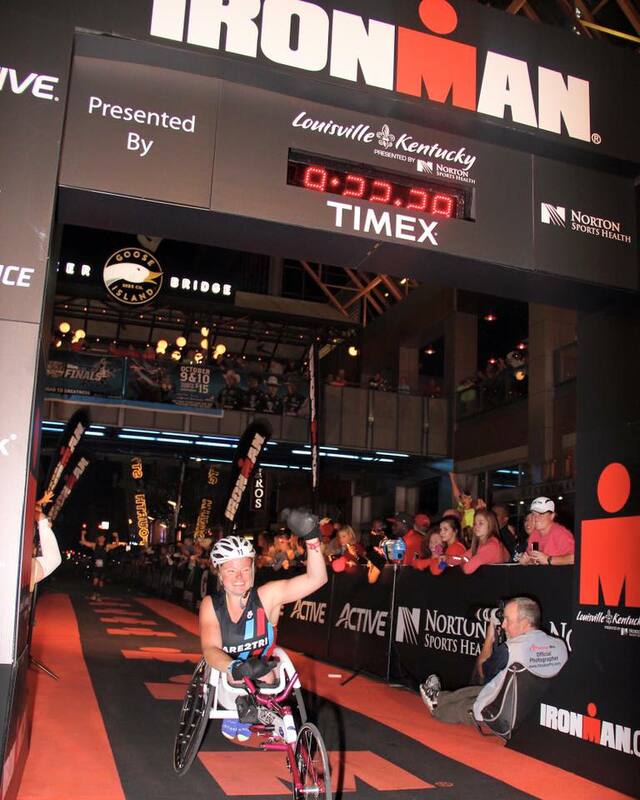 Next Sunday when the gun goes off at 7:30am to begin the 140.6 mile journey, I’ll be thinking of all of you as I make my attempt to finish Ironman Louisville.